A parking garage had collapsed and there were bodies buried in the rubble. But this wasn't a real disaster, and it wasn't a movie set either. 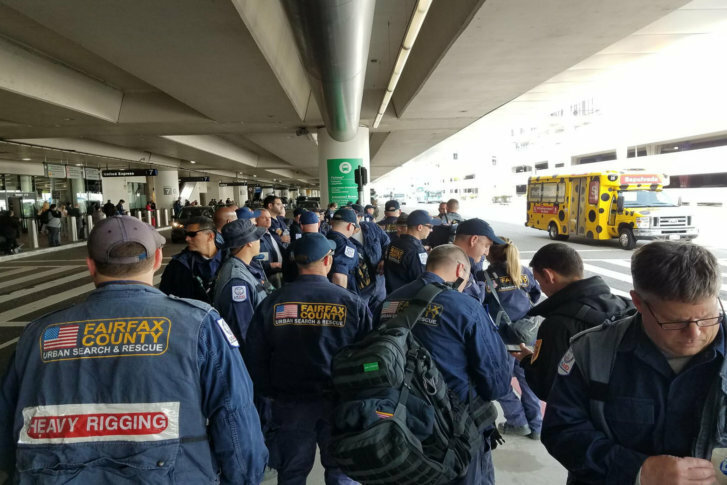 It was an annual training exercise that Fairfax County Fire and Rescue's Task Force 1 participated in this week alongside their counterparts in Los Angeles. This week, members of one of the most elite rescue teams in the world traveled from Northern Virginia to Los Angeles to immerse themselves in a disaster zone. A parking garage had collapsed, an elevator had too, and there were bodies buried in the rubble. Of course there was no disaster in California this week. But this wasn’t the set of a movie being shot either. Instead, it was an annual training exercise that Fairfax County Fire and Rescue’s Task Force 1 participated in this week alongside their counterparts in Los Angeles. Around the world, the team from Fairfax is known as USA 1, while LA is the home of USA 2. When disaster strikes, they’re the ones who respond, and they need to be ready for the worst disasters you can imagine. Hurricanes, earthquakes and structure collapses are all events they’ve had to respond to before. “We try to simulate as much as the situations that we encounter,” Bittinger said. The situations members of this elite team encounter go way beyond fighting fires and running the EMT calls that most members usually deal with at home. And it takes a range of often surprising skills. That’s why training this week involved working in very small, confined spaces underground and high in the air. To test the skills of their canines companions, they also had to play the victim, volunteering to get “buried” under collapsed buildings and made to sit there sometimes for hours; search dogs need to be able to train with real human scents that can’t be replicated by a mannequin. But Bittinger said that experience also has some benefit for USA 1 members who are used to doing the digging, not being dug out. One other fringe benefit of this training and experience, noted Bittinger, involved the care of animals. Since canines are bound to get injured as they claw through fallen buildings or hurricane devastated regions, the doctors and EMTs who serve on USA 1 need to be able to care for animals too. “Our doctors have to be trained to do some veterinary care, along with our paramedics,” noted Bittinger. And that’s training that could end up serving not just you, but your pet as well, if you experience a disaster of your own.